In a medium bowl cream the cream cheese together with crab, green onions, water chestnuts, garlic powder, and soy sauce. In a separate bowl, beat 1 egg. Lay out a wonton wrapper in the shape of a diamond. Place 1 teaspoon of the filling into the center of each wrapper. Brush the opposite corners of the wrapper with the beaten egg. Fold the edges over to form and triangle and seal. Heat oil in the deep fryer to 375 degrees. Deep fry in bathes (turning once if needed) until golden brown. Drain on paper towels. Combine crab meat, cream cheese, mayonaise, Sriracha, chives, and pepper in a bowl and mix until combined. Place 1 won ton wrapper in each muffin cup. The edges of the won ton wrappers will extend beyond the mini muffin tin cups and may need to be folded slightly. 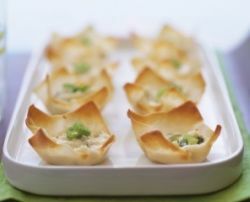 Fill the center of each won ton cup with crab/cream cheese mixture. Bake about 15 minutes or until edges of cups are golden brown and filling is heated through.